At the entrance of most beaches, there is a bulletin board with notices about water conditions: maybe a faded sign warning about rip currents and a list of this week’s tide tables. Most people pass them by without a second thought, but if you want to enter the ocean, it is important to know its movements, whether to avoid being caught in a riptide or to figure out when the waves will be at their best. A large movement of water in one direction is a current. Currents can be temporary or long-lasting; they can be near the surface or in the deep ocean. The largest ones shape the Earth’s global climate patterns and even local weather conditions, by moving heat around the world. 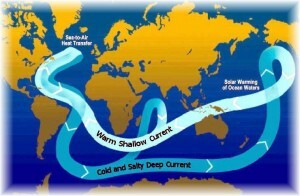 Many large currents are driven by differences in temperature & salinity. The highest surface part of a wave is called the crest and the lowest part is the trough. 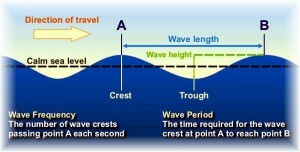 The vertical distance between the crest and the trough is the wave height. The horizontal distance between 2 adjacent crests or troughs is known as the wavelength. Wave height is affected by wind speed, wind duration or how long the wind blows and fetch, which is the distance over water that the wind blows in a single direction. If wind speed is slow, only small waves result. If the wind speed is great but it only blows for a few minutes, no large waves will occur. Also if strong winds blow for a long period of time but over a short fetch, no large waves form. Large waves occur only when all three factors combine. In the Arctic, cold salty water is left behind when ice freezes and this denser water sinks towards the seafloor. This starts off a planetary current pattern called the global conveyor belt that slowly moves around the world, taking 1,000 years to make a complete circuit. Scientists worry that the melting ice caused by global warming may weaken the global conveyor belt by adding extra fresh water in the Arctic. Ironically despite an overall increase in global temperatures, many places in North America and Europe may get colder as a result. Other large currents at the surface of the ocean are affected by global wind patterns and the Earth’s rotation, such as the Gulf Stream off the eastern United States and the Kuroshio Current off the east coast of Japan. Not all currents occur at such a large scale. 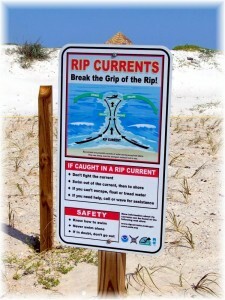 Individual beaches may have rip currents that are dangerous to swimmers. Rip currents are narrow channels of water that form when waves of different intensities break on the shoreline and generate currents that try to keep the water level even by pulling the large amount of water brought to shore by the waves back into the ocean. 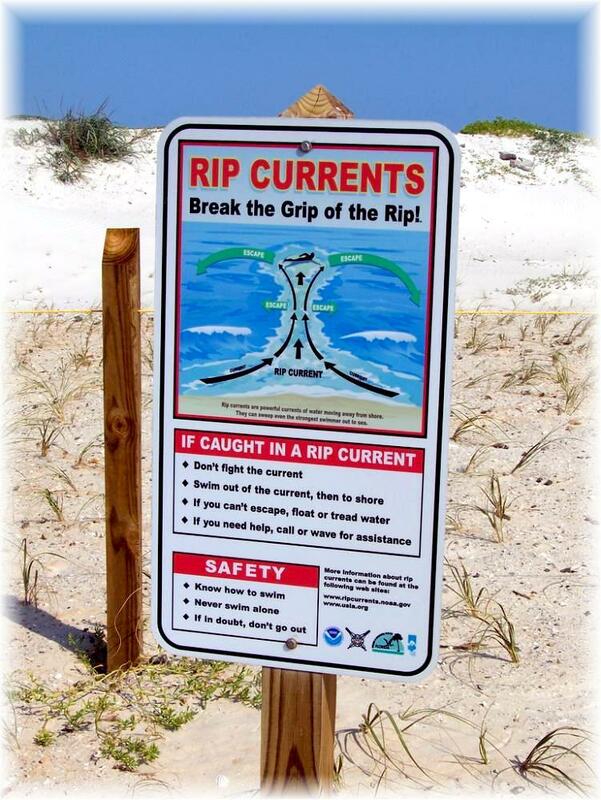 These rip currents can move faster than an Olympic swimmer at speeds as fast as 8 feet (2.4 meters) per second. At these speeds, a rip current can easily overpower a swimmer trying to return to shore. Instead of attempting to swim against the current, experts suggest not to fight it and to swim parallel to shore. Sculpting seawater into crested shapes, waves move water and energy from one area to another. Waves located on the ocean’s surface are commonly caused by wind transferring its energy to the water and big waves or swells, can travel over long distances. A wave’s size depends on wind speed, wind duration and the area over which the wind is blowing (the fetch). This variability leads to waves of all shapes and sizes. The smallest categories of waves are ripples, growing less than 1 foot (.3 meters) high. The largest waves occur where there are big expanses of open water that wind can affect. Places famous for big waves include Waimea Bay, Hawaii; Jaws, Maui; Mavericks, California; Mullaghmore Head, Ireland and Teahupoo, Tahiti. 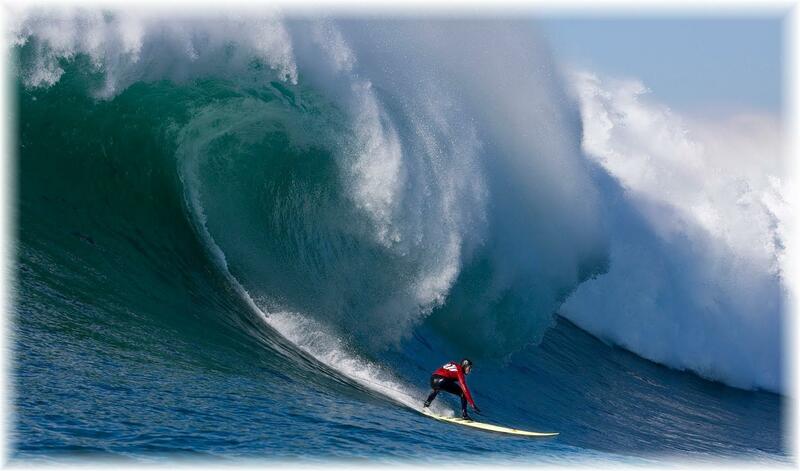 These large wave sites attract surfers although occasionally, waves get just too big to surf. Giant waves don’t just occur near land. ”Rogue Waves” which can form during storms, are especially big with reports of 112 feet (34 meters) and 70 feet (21 meters) waves and can be extremely unpredictable. To sailors, they look like walls of water. No one knows for sure what causes a rogue wave to appear, but some scientists think that they tend to form when different ocean swells reinforce one another. Wind is not the only cause of wild waves. A tsunami is a wave created by a disturbance that displaces a large amount of water, like an earthquake or a landslide and they often occur in clusters or sets. Tsunami waves are capable of destroying seaside communities with wave heights that sometimes surpass 20 meters (around 66 feet). Tsunamis have caused over 420,000 deaths since 1850. Over 230,000 people were killed by the giant earthquake off Indonesia in 2004 and the damage caused to the Fukushima nuclear reactor in Japan by a tsunami in 2011 continues to wreak havoc. 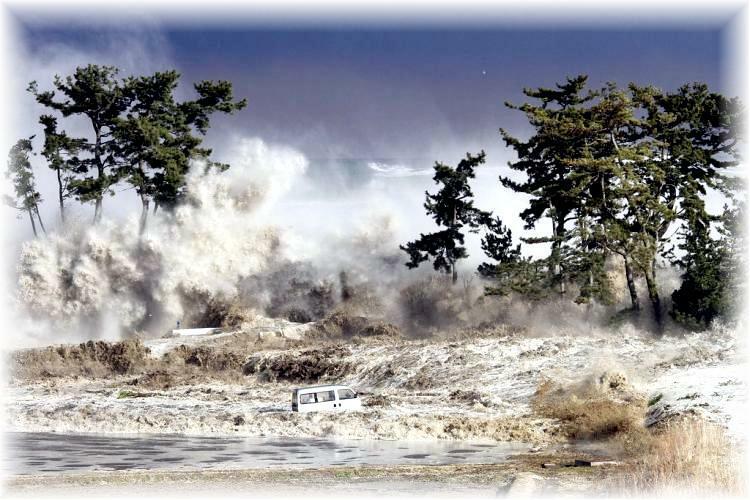 Although tsunamis cannot be predicted in advance when an earthquake occurs, tsunami warning are broadcast and any waves can be tracked by a global network of buoys. This early warning system is essential because tsunamis can travel at over 400 miles per hour. Tides are actually waves, the biggest waves on the planet and they cause the sea to rise and fall along the shore around the world. Tides exist thanks to the gravitational pull of the moon and the sun, but vary depending on where the moon and sun are in relation to the ocean as the earth rotates on its axis. The moon and sun’s pull cause two bulges or high tides in the ocean on opposite sides of the earth. The moon being so much closer, has more power to pull the tides than the sun and therefore is the primary force creating the tides. However when the sun and moon reinforce each others gravitational pulls, they create larger-than-normal tides called spring tides. The opposite of this when the gravitational forces of the sun and moon pull from opposite sides of the earth and cancel each other out, is called a neap tide and results in a smaller-than-usual tidal range. Tidal movements are tracked using networks of shore-based water level gauges and many countries provide real-time information with tidal listings and tidal charts. Tides can be tracked for specific locations in order to predict the height of a tide and when low and high tide will occur in the future. The Bay of Fundy in Nova Scotia, Canada has the highest tidal range of any place on the planet. 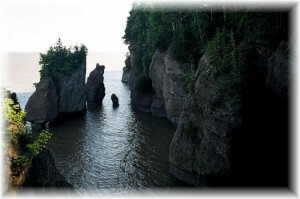 The tides there range from 3.5 meters (11 feet) to 16 meters (53 feet) and cause erosion, creating massive cliffs. This erosion also releases nutrients into the water that help support marine life. 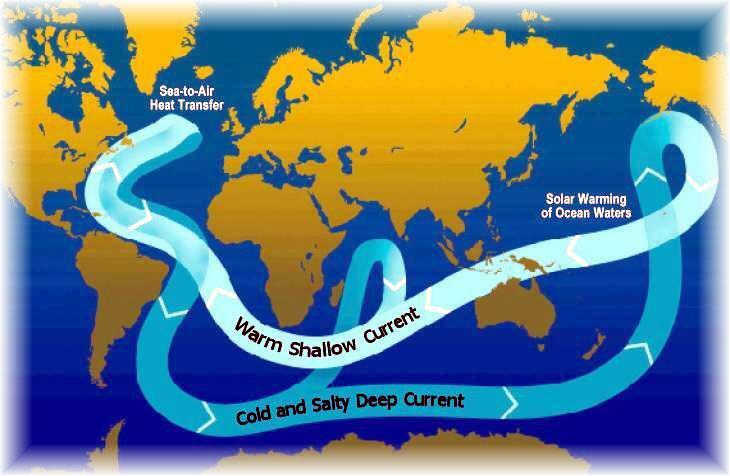 Currents associated with the tides are called flood currents or the incoming tide and ebb currents or the outgoing tide. Having reliable knowledge about the tides is important for navigating ships safely and for engineering projects such as tidal and wave energy, as well as for planning trips to the seashore.